1. The stately old junior high building, demolished after 65 years of service in 1975 and alluded to in the Rhythms & Muse storyline, stood at what Coeur d’Alene cross streets? 2. Coeur d’Alene High School, at least in the 1970s, had a small group of singers selected from among the Concert Choir members who performed pop, jazz, and other popular songs. What was this small group’s name? 3. In the novel, the heroine Alexandra Lauren’s locker number is #77. Why is that number significant to the author? 4. The novel’s hero, Matt Roberts, lives in one of the large historic homes across from a beach, the public/private rights for which have just recently been resolved. What’s the name of that beach? 5. Is there really a “secret” meadow above the shoreline of Casco Bay as detailed in the novel – a verdant green grassy patch formed from spring run-off and surrounded by pines? 7. The characters in the novel record a hit single at a famous crooner’s home on Hayden Lake. Although that blue-eyed singer did actually own a home on the lake, did it really have a built-in recording studio? More Cd’A trivia (part 2). 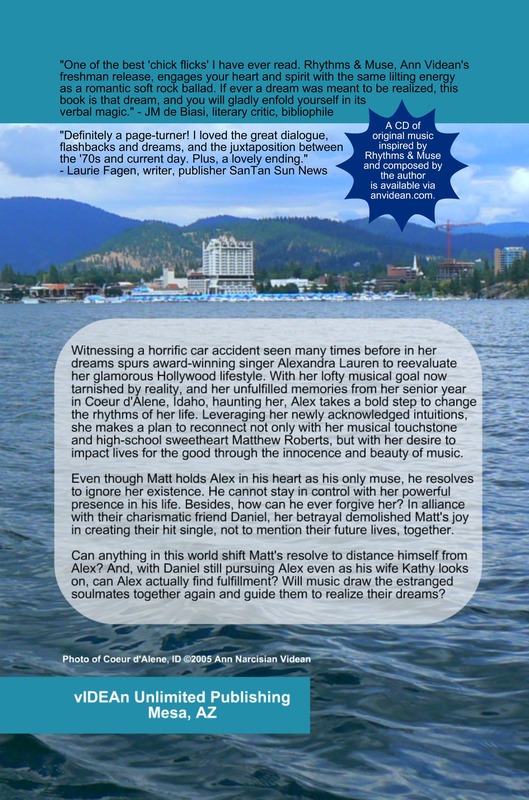 This entry was posted in All Posts, Coeur d'Alene, ID, Rhythms & Muse novel, Words: Serious Play and tagged 1970s culture, Ann Narcisian Videan, Coeur d'Alene Trivia, Rhythms & Muse, Videan by Ann Videan. Bookmark the permalink. 5. Not that I know of. If anyone has seen one, please tell me about it! 7. Nope, sorry folks. That’s why they call this fiction.